The gateway to the China pavilion is The Gate of the Golden Sun and is based on the beautifully styled main gate at the summer palace of Beijing. The most visually prominent feature of the pavilion is the half-size Temple of Heaven, which symbolizes the Chinese universe. Inside Epcot's Temple of Heaven is a Circle-Vision 360 theater that features the film, "Reflections of China," which gives guests a guided glimpse into Chinese history and culture. This pavilion is home to the House of the Whispering Willows, an awe inspiring exhibition featuring replicas of the clay cavalry created to protect China's first Emperor in the afterlife. Rally the troops to see these one-third-scale reproductions of the famed Terracotta Army of Qin Shi Huang. “Tomb Warriors: Guardian Spirits of Ancient China” lines up row after row of stalwart soldiers, replicas of those buried with the Qin Dynasty emperor in 209–210 BC to protect him from the evil spirits of the underworld. Marvel at the astounding detail and realism of these 197 men—almost every face has unique features and its own distinct expression. As you wander the exhibit, study genuine historical artifacts, including 2,000-year-old tomb sculptures from the Han Dynasty period, plus replicas of the emperor’s horses and chariots. 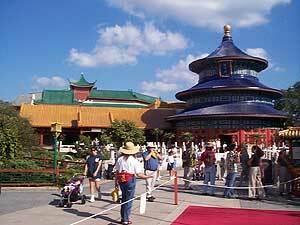 Food options in this pavilion include Nine Dragons and Lotus Blossom Cafe. Nine Dragons is a table service restaurant serving up a variety of Cantonese, Mongolian, Szechuan, Hunan, and Kiangche specialties. Lotus Blossom Cafe is an outdoor counter service location where you can find food such as rice bowls, sweet and sour pork, and eggrolls. Click for menus below!